The Woodland Trust are the UK’s largest woodland conservation charity. In December 2018 we were tasked with helping them spread the message in Bath regarding their fundraising project to protect the Avon Valley Woods. 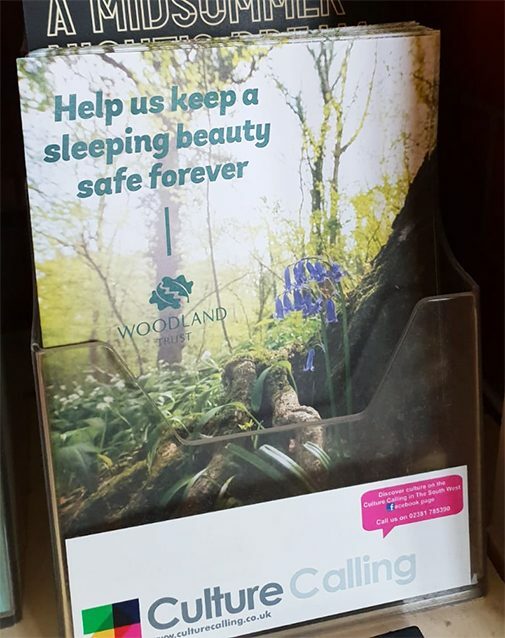 The Woodland Trust wanted to share their message during the lucrative Christmas period in Bath and needed a quick and effective distribution plan. They had 4,000 printed materials specifically designed for this area and campaign. They were looking to target locals with a cultural capital and appreciation for the local landscape who would already have a tendency to donate to charitable trusts. We focused distribution on our Baths Arts and Culture list that covers 60 key venues in central Bath. We completed the work in a two day period ensuring print was displayed across all sites at the beginning of December. Key venues on this run included: Theatre Royal Bath, Victoria Art Gallery, The Fashion Museum, The Roman Baths and the University of Bath. Within two weeks of the print hitting venues the Woodland Trust reported a notable increase in donations from the BS1 and BS2 postcodes that were directly attributed to our leaflet activity.